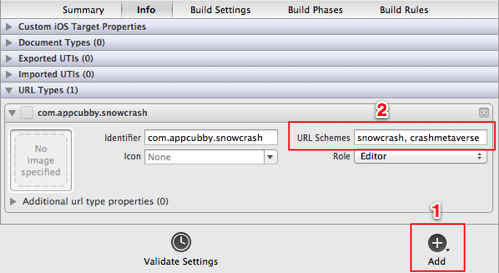 At the simplest level, a custom URL scheme allows users to open your app from other apps. But the true power of URL schemes is in the ability to perform specific actions as your app opens. Possibilities are endless! Some app developers provide a couple common links, while others provide deep links to just about everything. Click “Add” and select “Add URL Type” to create a new item. Enter one or more URL schemes in the field, separated by commas. Apple does not enforce unique naming for app schemes. If you use the same scheme as another app, iOS has no way of knowing which App to launch. In practice, this is a major source of confusion and bug reports. You’re much better off picking a unique URL scheme. The true power of URL schemes is in the ability to perform specific actions as your app opens. Anytime your app is launched (or resumed) from a URL, this method will be called. You then may respond accordingly within your app. How you structure your URLs is completely up to you. If you’re looking for even more URL scheme fun, you may want to check out http://x-callback-url.com/. It’s a great way to facilitate collaboration with other apps in the App Store. Once you’ve added updated your URL schemes, be sure to let us know!